Mr. Ravi Shankar Prasad, Union Minister of Communications & IT, handed over letter of commitments (of between INR 10 crore and INR 40 crore) from the INR 2,200 Crore Electronics Development Fund (EDF), a Fund-of-Funds sponsored by the Department of Electronics and Information Technology with CanBank Venture Capital Fund as its Investment Manager, to funds managed Karnataka Semiconductor Venture Capital Fund (managed by KITVEN), Exfinity Venture Partners, Forum Synergies and Endiya Partners. Mr. Prasad launched the EDF web site and provided the Inaugural Address at the event that Venture Intelligence helped organize. 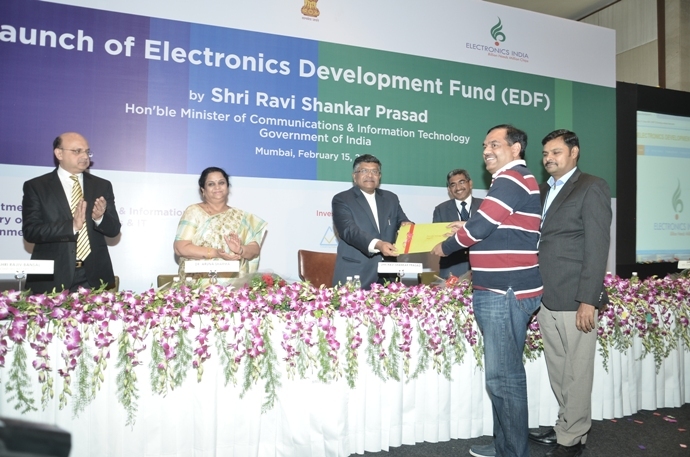 Other dignitaries who spoke at the EDF launch event included Rajiv Bansal, Joint Secretary, DeitY; Dr. Aruna Sharma, Secretary, DeitY; Mr. Rakesh Sharma, MD & CEO, Canara Bank and Mr. S.Thiruvadi, MD, Canbank Venture Capital Fund. Mr. Sridhar Venkiteswaran, Executive Director of Avalon Consulting, compered the event.